Need a way to punch your latest document but can't find a machine capable of taking on the task? You should check out the Carl extra heavy duty hole punch. 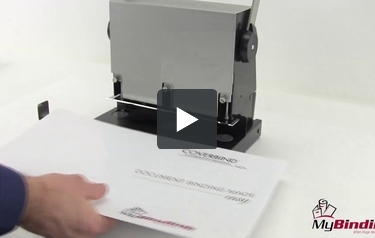 With the ability to 3-hole punch up to 300 sheets at a time, you can be done with your project exponentially faster than if you used a standard hole punch. This punch comes with a strong handle grip, built in paper guide and a transparent receptacle tray. Get punching! Hollow punch head technology requires less force. Built-in paper guide for quick paper positioning and punching. Preset to drill holes for standard three-ring binders. Limited Lifetime Warranty (excluding punch heads and disks). Print Center staff are very pleased with this product and how it preforms. We also ordered the Carl replacement punch kit for XHC-3300 - 9/32" as back up when needed. Would recommend this product. Heavy, well-made, and works perfectly. Easy to use and easy to dump waste. Very helpfull. Saves lot of time. I love it. Even though the equipment shows great quality at first glance, an instruction booklet should accompany the same. Used it immediately and "found out" what the side screws are for. Nothing complex or fancy but should be explained. When we found this punch we were a little bit skeptical that it would actually punch through 300 sheets. We decided to buy it and were going to return it if it didn't live up to the hype. We were surprised at how well it actually works and are definitely going to keep it. It allows us to punch an entire binder worth of paper at a time. Great for larger reports that our accounting department produces. Welcome to MyBinding video. Let’s check out Carl’s extra heavy duty 300 sheet 3-hole punch, the XHC-3300. This machine is built to last, built tough, and built for the big job. At its score, it’s a simple and straight forward 3-hole punch. Pull the lever down, it punches 3 holes, no problem, but its versatility is what makes the HXC special in its class. By losing the two knobs in the sides and choosing your own size here, you can have depth of margin control. A deeper margin is better for thicker books. There’s a built in guide that does not slip, push the button and the pin holds it in place for 17, 14 and 11 inches as standards. The fence will hold your stacks in place and make sure that each one of them is exactly the same throughout your entire run and allowing you the versatility of small and large documents. The lever itself is built on a rolling system so it’s very easy on the hand and wrist as you’re punching through your paper. The sharpness of the blade, this lever mechanism and easy to use allows you to punch up it 300 sheets of 20-pound paper in a single punch. Do keep in mind that the thicker the stack, the harder it is still to punch through all those papers. It’s capable but it takes a pretty heavy hand. More likely, you’d to go in stacks of 100 or 150. Those punch much more easily, it is still extremely efficient. There it is. That’s the Carl HXC-3300. For more demos, reviews and how to’s, check out MyBinding.com. Can you use it as a 2 hole punch? Thank you for your question. The dies/punches on the Carl Extra Heavy Duty 300 Sheet 3-Hole Punch are fixed and not able to be disengaged so unfortunately you would not be able to use it as a 2 hole punch. You can find Carl's 300 sheet 2 hole punch here . Would this successfully punch 3 holes through a composition notebook? Thank you for your question. The Carl Extra Heavy Duty 300 Sheet 3-Hole Punch - XHC-3300 is able to punch through up to 300 sheets of 20# copier paper. As long as the composition notebook is not too thick there should be no issues with punching it with the Carl Extra Heavy Duty 300 Sheet 3-Hole Punch. Can you remove bits to allow for single hole punching? Thank you for your question. The Carl Extra Heavy Duty 300 Sheet 3-Hole Punch is designed to work as a 3 hole punch and would not be able to be used as a single die punch. I work for a daily periodical that prints aprox. 400 copies a day between 6 and 30+ pages each. They come printed and staples but I have the task of three hole punching all of them. Will staples effect this tools ability to heavy duty punch holes? Thank you for your question. The Carl Extra Heavy Duty 300 Sheet 3-Hole Punch would be able to punch a pre-stapled document as long as you are not punching directly through the staple. We want ot puch through veneer to place into a selling book of swatches, can heads be changed when dulled and if so what is cost? Thank you for your questions. There are replacement heads available for the Carl Extra Heavy Duty 300 Sheet 3-Hole Punch. You can find them here . What warranty is offered with this product? Thank you for your question. The Carl Extra Heavy Duty 300 Sheet 3-Hole Punch comes with a Limited Lifetime Warranty (excluding punch heads and disks).